Shake things up a bit with this Pumpkin Pasta Sauce over your favorite, high fiber pasta instead of traditional marinara. It’s packed with vitamins and minerals and it is so rich and decadent, while still maintaining a light feel. The addition of the pumpkin and sage give it that wonderful, seasonal flavor without being overpowering. Feel free to add in some grilled chicken to bulk it and pack in some more protein. I love to serve this over whole wheat rotini noodles for the kids, as it’s a great way to get in some extra nutrition without letting them know that they are eating a vegetable. Keep in mind, this Weight Watchers Pumpkin Pasta Sauce Recipe lists the Points for the sauce ONLY, and does not include the pasta noodles. So, make sure to factor those in. This is an excellent family dinner recipe idea for a busy weeknight, as it can prepared pretty quickly and tastes fantastic. 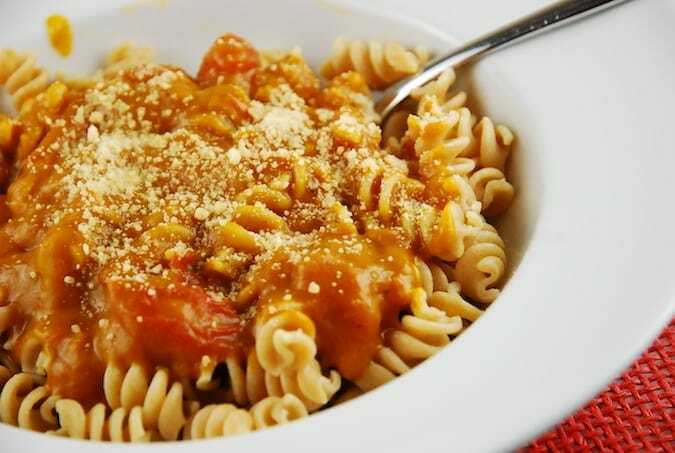 A pumpkin pasta sauce that is rich, creamy, comforting and sure to hit the spot. It’s a great seasonal alternative to traditional marinara sauce, and adds a ton of extra vitamins, nutrients and fiber. Melt butter in a medium sized saucepan over medium high heat. Add in tomatoes, onions and garlic. Cook, stirring regularly, until tomatoes are mostly rendered down, about 10-12 minutes. Turn heat to low and stir in pumpkin, milk, parmesan, oregano, basil, and salt & pepper. Cover and cook over low, stirring occasionally, for about 15 minutes. This is so good, I could eat it with a spoon. We spooned it over spaghetti squash for one meal and the second night over rotini. Brilliant flavor, love the herb combo with sage. Delicious! The pumpkin flavor is complimentary and not overbearing. Will make this many times! Thank you LaaLoosh!